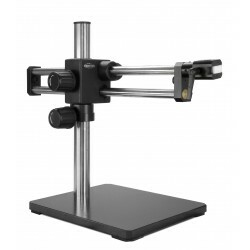 Scienscope manufactures a wide variety of stands including Single Arm Boom Stand, Dual Arm Boom Stand, Articulating Arm Stand, CF Articulating Arm Stand, Track Stand, and Post Stand. Choosing the right stand depends on bench space, environment, and application requirement. 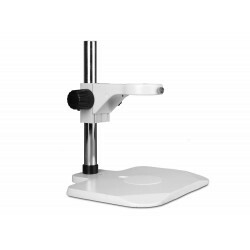 All Scienscope Video and Optical Systems are interchangeable with any stand and may be easily integrated into your workspace. Track Stand and Post Stand are affordable and compact. 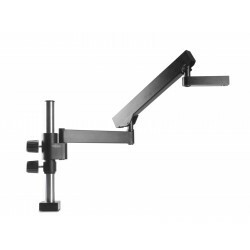 If desk space is an issue, the Articulating Arm and CF Articulating Arm will mount directly to the table. The Dual Arm Boom Stand or Single Arm Boom Stand provide a rugged design using linear ball bearings, and heavy duty platforms to overcome issues like vibration and smooth motion of optical/video system over the part. Stands There are 13 products. 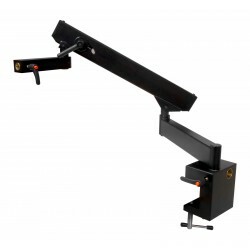 Articulating Arms have an adjustable counter-balanced arm which allows easy, hand guided up and down movement, works in spaces where a conventional boom stand will not fit. The Single Arm Boom Stand has a solid cross block and brass inserts to improve the vertical and horizontal arm movements. 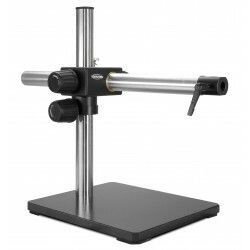 Single arm boom stands are perfect for routine inspection of large samples where continuous horizontal movement of the stereo is not required. 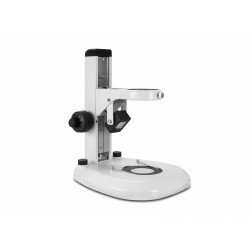 Scienscope Ergo Large Base Track Stand. Features: Large, flat, ergonomic base. Perfect for prolonged viewing of small parts. 76mm microscope ring mount holder. Rugged vertical gear track. 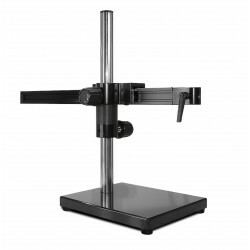 Scienscope Ergo Large Base Post Stand. Features: Large, flat, ergonomic base. Perfect for prolonged viewing of small parts. 76mm microscope ring mount holder. Rugged vertical gear track. Dual Illuminated LED transmitted and reflected Track Stand. Features: Adjustable LED transmitted and reflected light. Rack & pinion adjustment for smooth movement. Dual Illuminated LED transmitted and reflected Track Stand with fine and course focus. 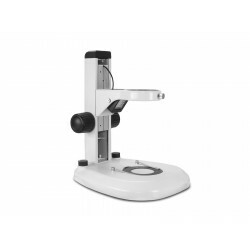 Features: Ideal for critical focusing at high magnification. Adjustable LED transmitted and reflected light. Rack & pinion adjustment for smooth movement. Extended vertical post for great working distance. Rack and pinion focusing with safety collar. 18" vertical travel for greater range of movement. Ideal for smaller parts or crowded work areas. 76mm e-arm/focus mount wiht a vertical travel of 1" up and down. Fits all our Scienscope binocular series. 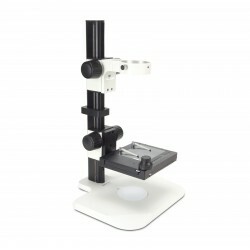 Scienscope Extended Heavy Duty Large Base Track Stand. Features: Large, flat, ergonomic base. Extended vertical post for greater working distance. 76mm microscope ring mount holder. Rack and pinion focusing with safety collar. Ideal for smaller parts or crowded work areas. 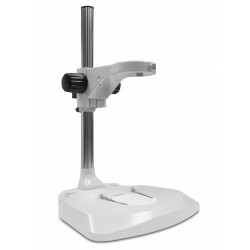 Scienscope Heavy Duty Flexible Stand with Bolt Down Base. Features: 15" Steel vertical post to free up bench space. Rugged and ideal for a wide range of inspection applications. Adjustable counter-balanced arm allows, easy, hand guided movement. Easy to lock in focal distance. 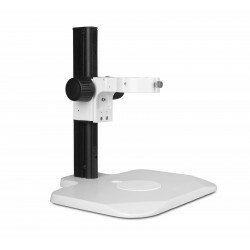 Scienscope Heavy Duty Flexible Stand with "Clamp" Base. Features: 15" Steel vertical post to free up bench space. Rugged and ideal for a wide range of inspection applications. 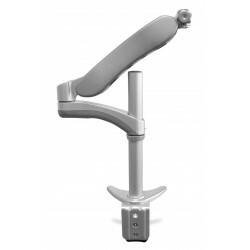 Adjustable counter-balanced arm allows, easy, hand guided movement. Easy to lock in focal distance.